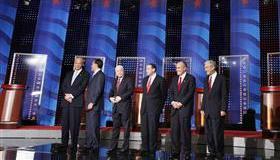 On Thursday, January 10, 2008 before the South Carolina primary, the Republican candidates debated in Myrtle Beach. The event was televised by Fox News. Mitt Romney got the first question about the chances of recession, he claimed that he turned around the economy is Massachusetts, and talked about ways he could improve the nation's economy. He also mentioned McCain, which gave the Arizona Senator the chance to respond next. He talked about adult education as the answer to jobs that aren't coming back, and denied that there was any recession coming. He promised to end money leaving the country for oil-producing nations, and said that he was not Miss Congeniality. Huckabee then spoke about oil and gas prices, and how they affect the entire economy. He said we suffered from "enslavement to foreign oil". Giuliani, as in many speeches before, continued to promise tax cuts. He insisted that they would lead to more revenue in federal coffers. He said that they, and cutting spending as well as deregulation would prevent recession. He actually never mentioned 9/11 in his opening comments. After he spoke, McCain spoke again and claimed tax cuts were his idea first. Ron Paul said that we were already in recession, and continuing to do the wrong thing will make it worse. He blamed it all on the Federal Reserve, and cheap credit. He even referred to the housing market as in depression. Fred Thompson also repeated the party line about tax cuts stimulating the economy, and called for making Bush's tax cuts permanent. All but Paul mentioned Ronald Reagan when talking about the economy, and claimed to be his true successor. Reagan's name was mentioned at least a hundred times. After the talk of domestic issues, the next topic was foreign policy. Many sabers were rattled at Iran, except for Ron Paul who compared the recent incident with Iranian speed boats to the Gulf Of Tonkin incident. After a while, a question from the audience was allowed. A man asked: "You have talked a lot about your religious faith, but to many of us this seems like mere lip service. As is says in The Gospel, Mark Chapter 16, verses 17 and 18: 'And these signs shall follow them that believe; In my name shall they cast out devils; they shall speak with new tongues; They shall take up serpents; and if they drink any deadly thing, it shall not hurt them; they shall lay hands on the sick, and they shall recover'. What will you do to demonstrate that you are indeed believers, and you are not just pandering to Christian voters?" Mitt Romney was the first to respond by raising his arms into the air, and saying "Nae wanna wanga won kee choo bah kah! Ooh tee di. Chee ah coe ah tang gue wah," then began to wave his arms. Huckabee chimed in waving his arms, shaking his head, and uttering, "Ph'nglui mglw'nafh Cthulhu R'lyeh wgah'nagl fhtagn." Ron Paul and Fred Thompson also made seemingly gibberish sounds. Giuliani said that he was Catholic, and did not subscribe to that misinterpretation of scripture. He tried to change the subject to September 11th, saying, "Nine-eleven, ladies and gentlemen. Nine-eleven changed everything. I was there for New Yorkers on that day, and for America. I made the trains run on time in New York. I will do again as president what I did as mayor. We must never forget what happened on September Eleventh, Two-thousand and one. As he spoke, the speaking in tongues and arm waving continued, and several crates were brought onto the stage. Huckabee was the first to reach inside one, and pull out snakes. He held them high, and shouted "who will join me in taking up serpents?" Romney, Paul and Thompson joined in. They seemed uncomfortable, but did it all the same. Ron Paul and Fred Thompson were soon bitten by their snakes, and quickly dropped to the floor. Huckabee and Romney put their snakes down, and laid hands on them, but both bite victims still had to be rushed to a nearby hospital. Giuliani and McCain did not handle snakes. McCain even said, "You should not put your Lord to the test." Huckabee then produced a canister of something with a poison symbol on the side, poured some into his water glass, and drank. He was not affected by it. After this, the moderators ended the debate. As the crowd began to disperse, I was able to get backstage to have a closer look. Evangelical Christian voters need to know that Huckabee and Romney deceived them. Huckabee's snakes may have looked threatening, but were all non-venomous. This is not what was meant by "taking up serpents". His "poison" was only seltzer water. Romney's snakes were not even real. They were animatronics. Only Ron Paul and Fred Thompson handled actual venomous serpents, and both were bitten. I guess that there is just no length politicians will not go to in pandering to voters.